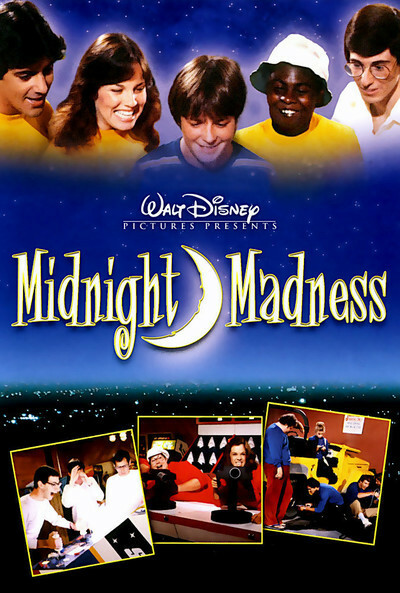 "Midnight Madness" is a very bad movie, but there's a good story behind it, and the story's worth telling. It's about these two kids named Michael Nankin and David Wechter, who began making films together when they were in eighth grade. They started with super-8 film, worked their way up to 16mm and enrolled in two of the most prestigious film schools - Nankin at UCLA, Wechter at USC. Still collaborating, they made a short subject entitled "Gravity," a satire on classroom educational films in which their animated hero solemnly explained how to conserve gravity. It was a big hit on the film festival circuit, so then they decided it was time to make a more ambitious film. They wrote a script named "Junior High School," which would be a musical about young love, bitter jealousy and cheating on exams, and would be shot entirely on the campus of a junior high school. Their film schools, which annually finance a certain number of student films, liked the screenplay but declined to back it because (a) it would be relatively expensive, and (b) Nankin and Wechter were just in their second year of school. So Nankin and Wechter made the film themselves. It eventually cost around $25,000, which they scrounged from their parents, from bank loans and from the American Film Institute. And it was a terrific movie. I saw "Junior High School" for the first time last March, at the USA Film Festival in Dallas, where it delighted its audiences. It's won all sorts of film festival awards, and played here commercially not long ago at Facets Multimedia. And it caught the attention of Ron Miller, the executive producer at Walt Disney Productions, who fulfilled all young filmmakers' dreams when he called the two into his office and, point blank, offered them office space, a salary for six months and a promise to seriously consider producing whatever project they came up with. The movie is a big disappointment to me, because I liked "Junior High School" so much. It's a pleasant, well-meaning little comedy, and it's obviously trying for the same kind of innocent, sophomoric humor that was so charming in "Junior High School." But it just doesn't have the same magic. A lot of its jokes miss, the pace is slow, there are too many characters to keep track of and there's an unpleasant streak of nasty humor directed at characters who are fat, ugly, old or otherwise out of step with Southern California physical ideals. The movie seems to have been cast, indeed, from the further shores of strange character actors. Of the five teams engaged in the scavenger hunt, one is made up of kids with sloping chins and big noses, another one has two fat twin girls and a third is led by Stephen Furst, the chubby kid in "Animal House" whose fraternity brothers wrecked his brother's car. All of the teams race around Los Angeles, tracking down clues while the hunt's mastermind follows their progress on a big map in his apartment. Is there anything heartening about this movie? Well, there's the consideration that, at ages 23 and 24, Wechter and Nankin still have their careers ahead of them and have shown in "Junior High School" that they have filmmaking gifts. What they need to do now, I think, is spend a great deal of effort on their next screenplay; the problems with "Midnight Madness" seem to have started at the screenplay stage, when they saddled themselves with an unwieldy plot containing far too many characters. It's encouraging that Disney's Miller gave these kids a chance - and on the basis of "Junior High School," his hunch was a sound one. But now its back to the old drawing board.